Earlier this year, Scout, a dog, was hit by a car that slid on some ice. As a result of the accident, one of his back legs had to be amputated. 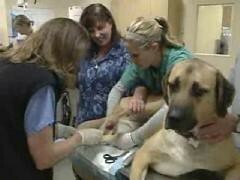 Scout’s vet will be performing a “revolutionary procedure” on Scout’s leg this summer. The process is called biointegration and “skin, muscle and other soft tissues and bones will grow into certain metallic implants.” So basically this means that the prosthetic leg will be permanently attached. The vet previously had first performed this surgery on a dog named Triumph and it was successful. If biointegration continues to be successful on dogs, these procedures may next be used on humans. The procedure on Scout will cost $20,000. This entry was posted on Wednesday, May 23rd, 2007 at 3:52 am	and is filed under Dogs, National Dog, Cat & Pet Info, News for Cats, Dogs & Owners, Veterinary/Medical. You can follow any responses to this entry through the RSS 2.0 feed. Both comments and pings are currently closed.